THIS WATCH HAS BEEN SOLD! 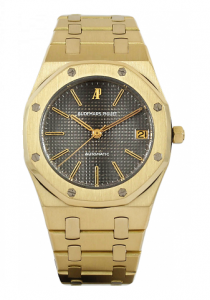 Pre-owned, in ABSOLUTE LIKE NEW CONDITION WITH ORIGINAL AUDEMARS PIGUET BOX. Traditional 36mm case, automatic movement, and solid gold case back. The bracelet features a flip lock clasp.